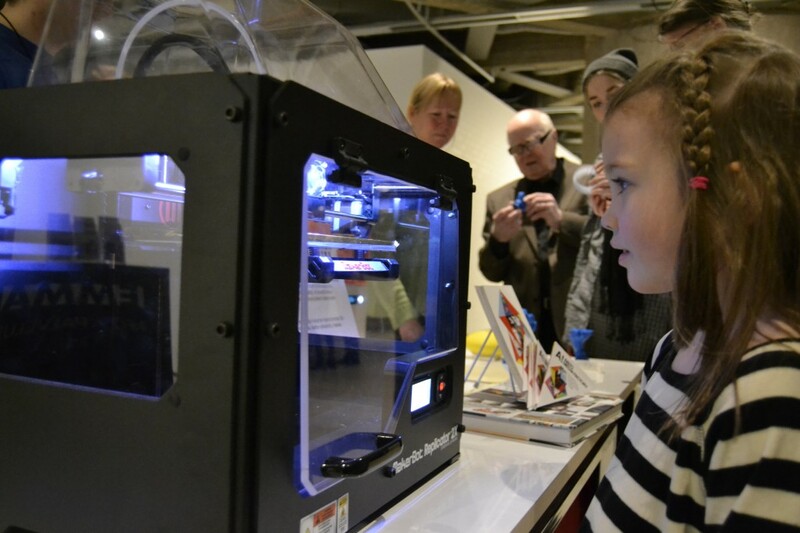 Aalto Fablab participated Espoo Mini Maker Faire at Design Factory on 17 – 18 Oct 2015. Charlie and Solomon presented among others a new pick and place machine called LitePlacer in which you can assemble complicated circuit boards. There was also other things in the Mini Maker Faire, which has it’s origin or some other connections to Aalto Media Factory and Aalto Fablab, like for instance the laser-cut guitar, Trash Lab and Fortune Tweeting Bird. 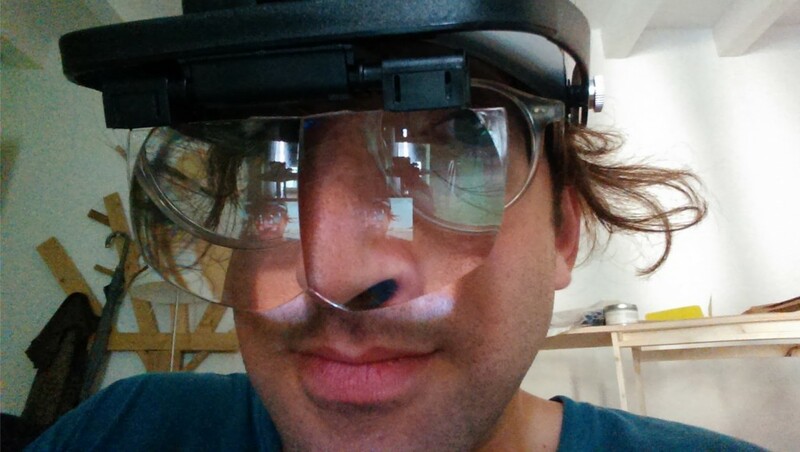 From mid-October to January artist, curator and writer Micah Silver will be immersing themselves in the Aalto community with a base at the Media Factory’s FabLab. This will mark the beginning of the first research phase of a public art work called One of Many Possible Irreonciliations Between the Finite and the Infinite which will be installed at a large public park in New York City in 2017. The work will use air as a time-based compositional material to re-shape the airflow regime of the Park. Silver began working with air having finished a long phase of working primarily with audio. The work for the park will take both a rigorous observational/quantitative approach to visualizing the airflows in the park over the period of a year. From the evolution of these observations Silver will be fabricating a sequence of physical extensions to the park’s trees and landscaping that will replace the inherent, natural change introduced as over a million leaves fall from the many mature trees in winter. At the FabLab Silver will begin to produce prototypes for various aspects of the work’s production and develop the basis for production and do acoustic and airflow testing using Schlieren photography. Silver lives in Los Angeles and holds degrees from MIT and Wesleyan University in the United States. Quiet humming and screeching fills the upstairs lobby of EMMA, Espoo Museum Of Modern Art, before the audience walks through the doors and up the stairs. 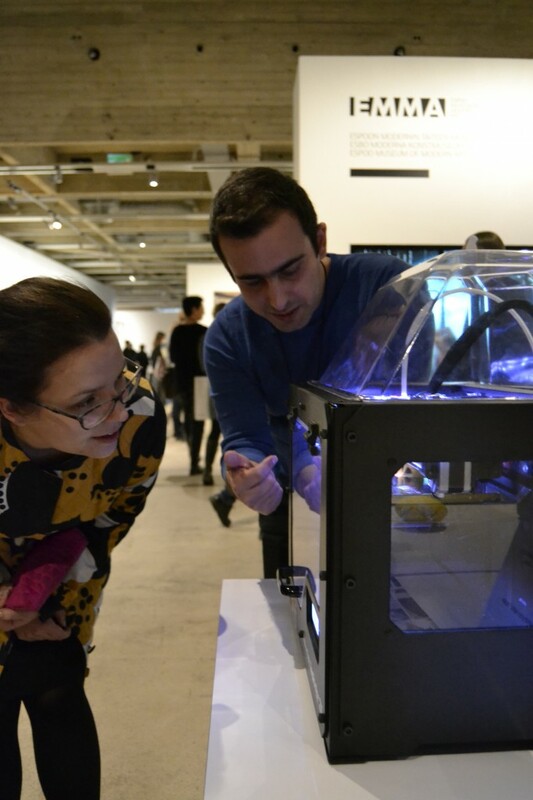 The sound comes from the two 3D printers that are working on small pre-designed models, demonstrating 3D printing to the visitors of the museum. 3D printing station gathered quite the crowd of interested museum visitors at EMMA. Aalto FabLab of Aalto Media Factory sent over the 3D printers as well as their experts Charlie Banthorpe and Ali Neissi to bring 3D printing close to all museum visitors. And what a welcome they got! The new technology clearly intrigued people, keeping both Charlie and Ali busy throughout the evening. Aija Pippuri (on left) saw 3D printing for the first time in her life. Ali Neissi from Aalto FabLab answered Aija’s questions about the technology as well as the material used in the printer. 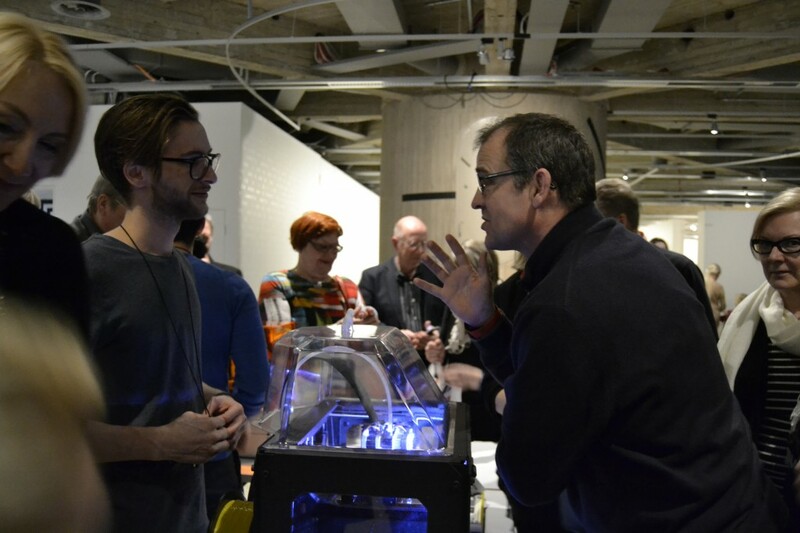 “This is the first time I’m seeing the process of the printing, although I’ve seen 3D printed items before,” said John Calton (on right), who discussed about the commercial possibilities of 3D printing technology with FabLab’s Charlie Banthorpe (on left). “I’m going to stand here and watch until it prints the head for the dog as well!” swore Silja Toiviainen while concentrating on the printer, which was indeed printing a miniature model of a dog. “This one is going to be called “Sun”. And Charlie [Banthorpe from Aalto FabLab] promised that next we’ll print a white one!” Silja said. 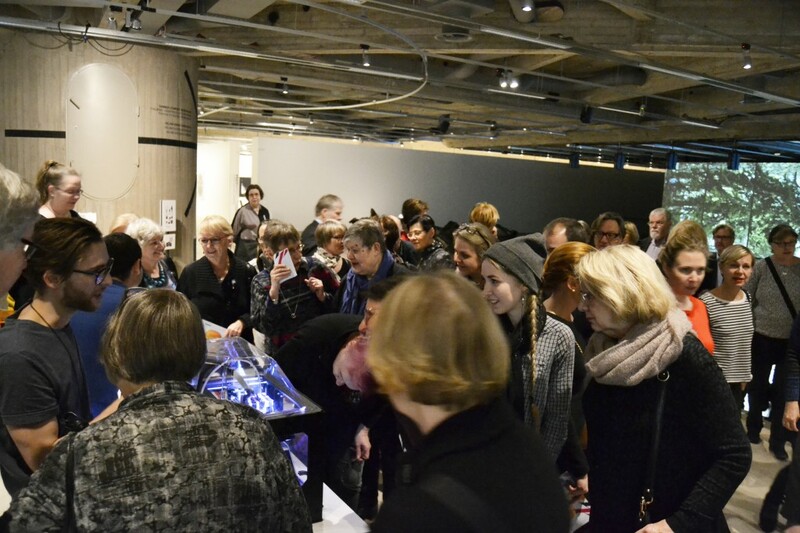 The 3D printing station at the opening of Pop Art Design –exhibition is the first of the four occasions that Aalto FabLab will be at EMMA this spring. You can catch us during the Children’s Museum Festival on 28.-29.3. as well as at EMMA on POP! –event on April 26th. At both events the printers and our staff will be at the museum from 12-15.00. Want to learn CNC at FabLab? Charlie is your guy. Meet Charlie. He’s our new set of helping hands to assist you, who want to learn CNC from scratch or just want some assistance on your project. 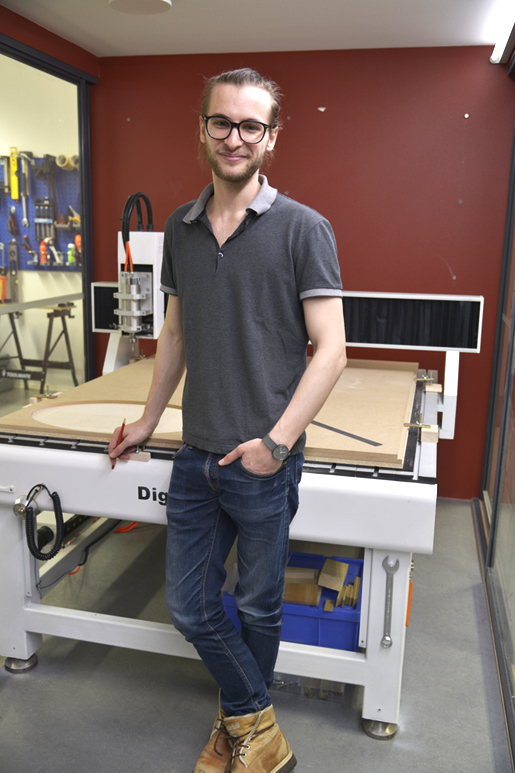 Charlie started showing up at FabLab working on his own projects, testing his furniture designs with the CNC. Soon enough, our FabLab-staff Anu and Ali noticed that he was also helping other makers around the FabLab, offering his expertise on CNC. Now he’s here to help you all until mid-June. You don’t want to miss this opportunity! Charlie is around mostly on Wednesdays (for all Aalto people using FabLab), as well as on Tuesday afternoons for Open Day. Electronics for Artists is here again! In Electronics for Artists you will be acquainted how to design a circuit board, how to make a PCB and how to solder the components on the board. You will also get your hands on experience with measurement devices and after being familiar with them you will learn how to test and debug your circuit boards. In these sessions you will also learn about micro controllers, work with Arduino and teensy and experiment with sensors and actuators. We are planning also to talk about how to connect the Arduino to the internet and more about communication. Method: In each session we are going to do a small project together. No signing up is necessary. A group of students from the Scenography programme of Aalto University School of Arts, Design and Architecture visited FabLab. Short test-projects gave the students ideas how the FabLab facilities could be utilized in their studies and work in the future. 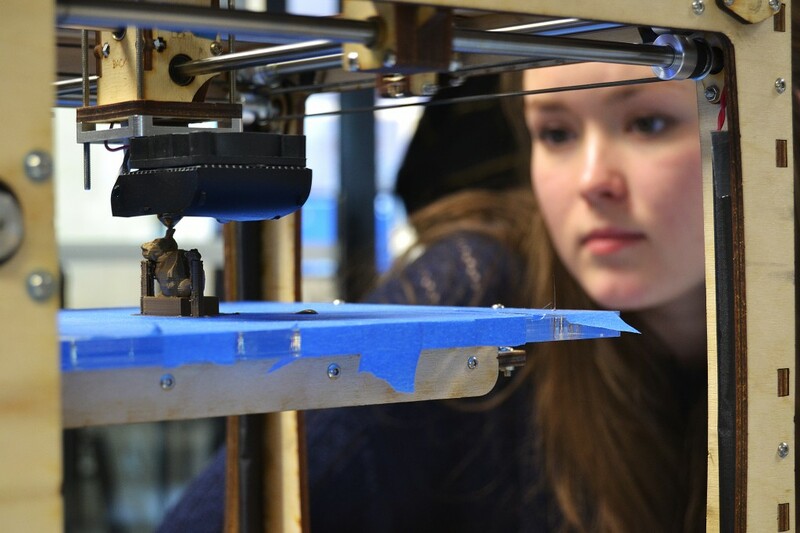 After getting to know the possibilities the different machines in FabLab offer in terms of creating, the students took a day to plan a test-run project. Later the same week, the group came back to get some hands-on experience with for example 3D printing. Bea Tornberg oversees the printing of her statue. Bea Tornberg tried out 3D printing by creating a small animal statue. “I’d imagine this would be a good way to create very small, detailed items that are very difficult and time consuming to fabricate in a workshop by hand,” Tornberg said. For bigger objects Tornberg still prefers good old-school handwork. She feels it is in some cases quicker than 3D printing, which takes a while for larger objects. 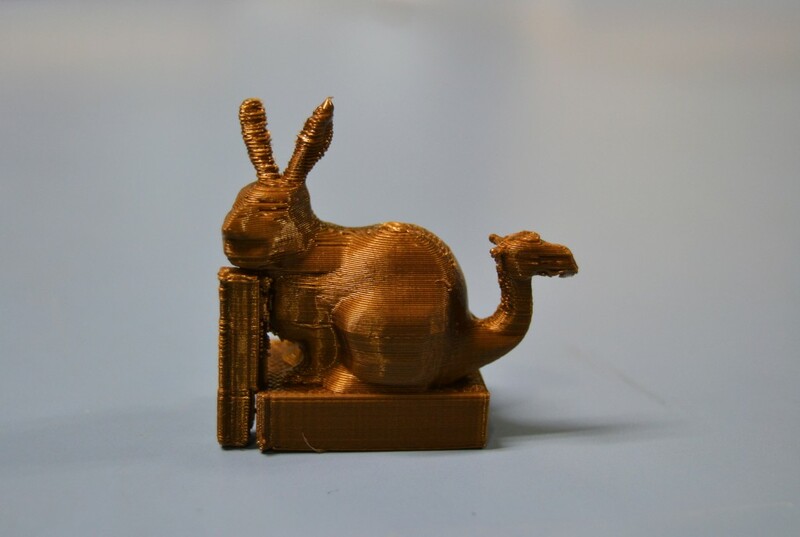 Tornberg’s 3D printed rabbit-camel hybrid. At the next table Aapeli Savola was attempting to replicate foliage by etching copper. First Savola printed the design on a transparency paper, which was then placed on a protected copper before projecting UV-light on the plate. After treating the material with the light, the copper plate was dipped into developer fluid to remove the protective layer of the copper from areas affected by the UV-light. With the protective layer gone, dipping the copper to the etcher solution results in the unprotected parts to corrode entirely, leaving only the foliage pattern behind. The process turned out to be a bit tricky and required testing on different batches of material. “This definitely requires more testing. The first try did not bring the result I was after,” Savola said while studying the result of his first attempt on the foliage. Creating replica of foliage requires some testing. Like any other Aalto student, everyone from this group is welcome to continue their projects at the FabLab outside courses. After all, FabLab is the place for testing, failing and trying again, with staff that will work with you to get your project just right. Savola’s copper plates were left to corrode in the etcher for overnight. Photo of the results will be release at FabLab’s Facebook page once the fluid has gotten its job done. If you’d like to bring the students from your course to visit FabLab or do some course projects in our facilities using our machines, don’t hesitate to contact the FabLab staff, Anu Määttä and Ali Neissi, to schedule a time for the group’s visit: fablab@aalto.fi. Each month during 2013 we organise and promote a Trashlab Cafe event at a different location. 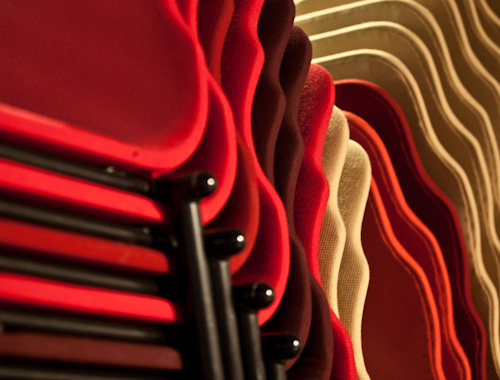 In November we´ll meet in Aalto Fablab, in Arabianranta from 12 to 16.00. In this workshop our old friend and a DIY-wizard Albert Laine will lead the repairing. Albert will help with wood, electronics and other items. 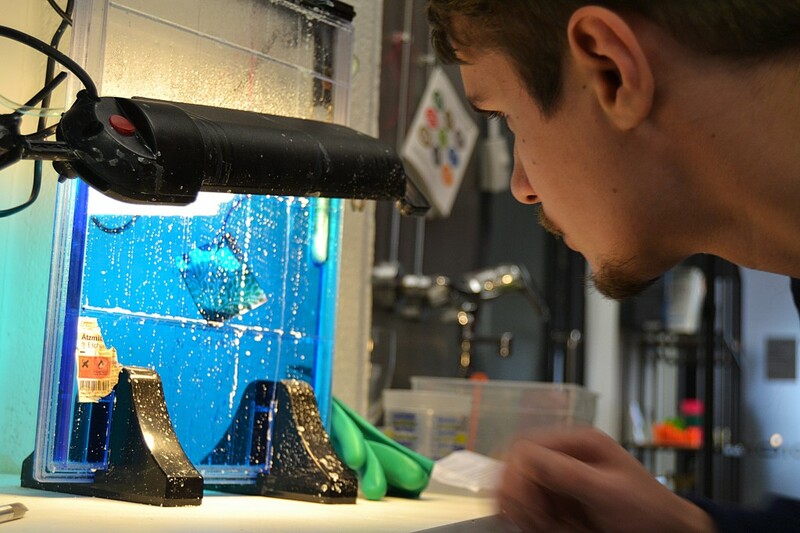 We offer knowledge, tools, some spare parts and learning support! Keep in touch online by join the Facebook group ‘Trashlab’ for notice of events.. Or send an email to: andrew [-at-] pixelache.ac and he will add you to trashlab [-at-] pixelache.ac list [which is a google administrated group of pixelache.ac], and this list promotes the different Trashlab events outside Facebook.